Screenshot from the Selfridges website, not my picture. We are currently switching bedrooms (3 ways which sounds complicated but it's actually the easiest way) & it is bedlam at the moment. I haven't been able to get out to take an outfit photo this week so instead I'm going to post about something that is happening at the moment. 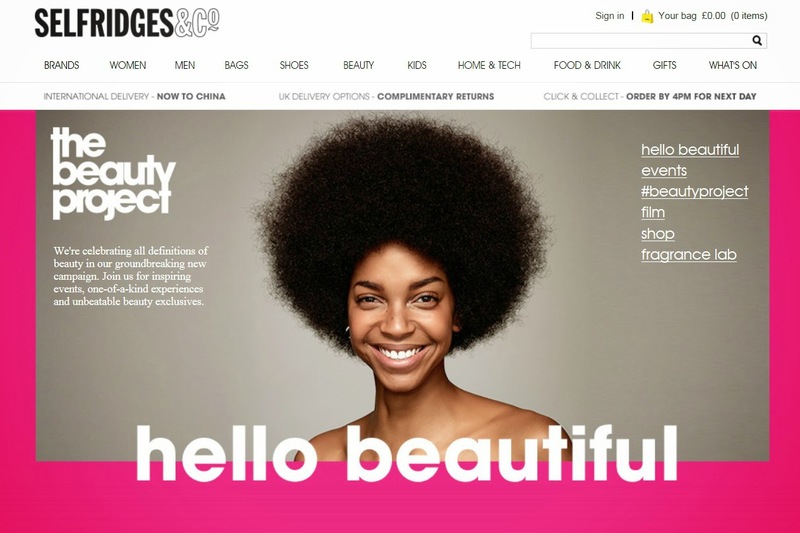 Selfridges launched their 'beauty project' yesterday & it is AMAZING! Selfridges has set up a 6 week programme based around beauty: what it means, what impact it has, beauty tips, beauty & gender identity, beauty in different ethnic groups, beauty in society, beauty as a means of self expression, beauty & feminism. 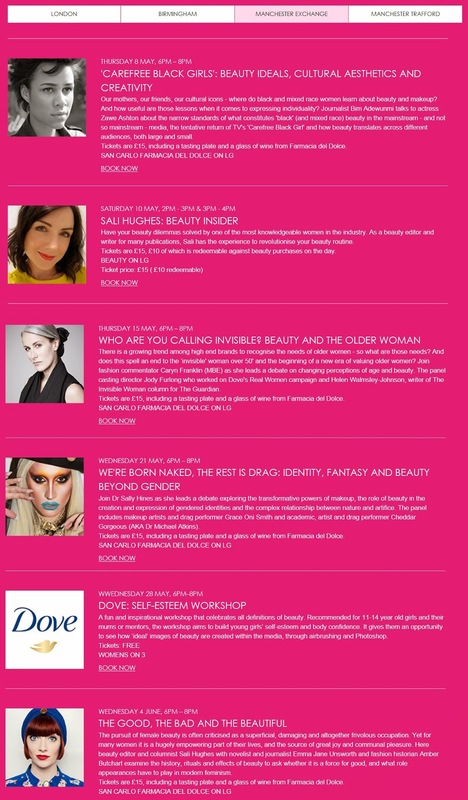 You pick a beauty related issue & they have a panel on it (with a glaring exception of beauty & disability but I'm cutting them some slack, what they are doing is amazing, they can't deal with all the big issues in one go). I can't make any of the events/debates (they are often on an evening, far from where I live & either during the room moving or during my foster brother's exams). However I have spent enough time perusing the events calendar that I have a few thousand recommendations that you guys might want to try to get to. Starting with the events in London I have compiled a list of the ones I want to go to the most. There are...well there were about 20 that I was really, really interested in so there are a few missing from this list. I've narrowed it down to 11 & I can't make the list any smaller, I really can't. I've included a beauty tutorial from Charlotte Tilbury, one from MAC discussing international beauty trends & one from Illamasqua on 'Timeless beauty', beauty through the ages & all that. There is one from La Prairie discussing beauty myths &, well...lots & lots & lots of debates & panels; the psychology of beauty, the future of beauty, beauty & body image, the banning of airbrushing, the politics of black hair, beauty & feminism & the reinforcement of gender stereotypes in young girls. So; a body image workshop, a panel on beauty & being manly, whether beauty empowers women, natural beauty, skin lightening as an issue & a Henna master-class (I've lived my whole life in a predominantly Asian area & henna has always fascinated me, this would be so cool!). Finally, Manchester & the panel I almost booked but can't attend. 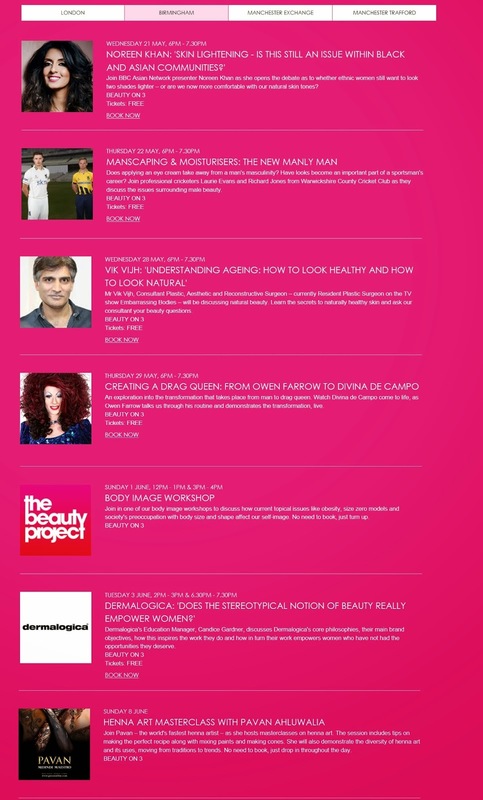 Manchester Exchange Square has some amazing events on including; Black & Mixed-Race beauty, beauty & the over 50s, makeup, beauty & gender identity, self esteem workshop aimed at 11-14 year old girls & the one I wanted to attend. The Good, The Bad and The Beautiful which is ON MY BIRTHDAY, it's like it's destined! It's discussing the empowering nature of beauty & beauty rituals, the role of appearances in modern feminism & the history of the lot of them. So perfect for me! It is not to be however so if you go make sure you tweet me what happens! Obviously there are a lot more panels (there are so many!) & some of the ones that didn't appeal to me might be really interesting to you so I definitely recommend that you look at the events page yourself, even if it is just to be amazed that a department store is spending their own money to put on such a huge project! Which, if any, of the panels do you want to go to? What do you think Selfridges should do panels on if they do events like this again? I think they need to discuss beauty & disability - obviously - & beauty in the transgender community (I know they've done drag makeup but there is more to discuss). If you are going to a panel will you tell me what happened & take a bunch of photographs or footage? Please?